Fractazmic by I See Cards is a fun card game to help children learn and practice calculating with fractions. The basic Fractazmic game can be played with 2-4 players. Each player gets dealt a set of cards and they try to make a "hand" by collecting a set of cards in the same suit that add up to 1. This involves converting fractions, multiplication, and addition. The rest of the cards are placed face down in the middle of the table with one card turned up to start the discard pile. If a player can not make a hand with the cards they have they can either choose a card from the stack that is turned down in which case they then have to place one of their cards in the discard pile or they can pick any card in the discard pile but they must take all cards placed on top of the card they want. The game ends when the first person runs out of cards and the winner is the person with the most hands that add up to 1. 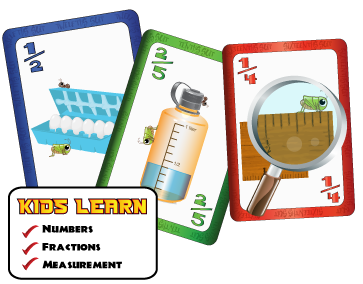 Although the game states that it is geared for students in grades 1st-8th grade, I think most 1st graders would have a hard time with all of the calculations that have to be done. My son is in 2nd grade and he seemed to take a long time doing the calculations to determine if he had the cards he needed to make a hand or if pulling a card from the discards would make a hand. However, he never grumbled about doing the math and seemed to have fun the whole time. ...especially when he beat Daddy! There are many different ways to play with the Fractazmic cards. There is a booklet on the I See Cards website that explains some of them. Fractazmic include 60 cards and an instruction sheet. They sell for $6.95 and are available on the I See Cards website. Fractazmic is a fun way to help teach and practice math skills with fractions. It can be challenging for younger children but game play can be adapted to accomodate early fraction skills. My son gives it a 4.5 stars out of 5 because game play can slow down at times if there is a lot of calculating that needs to be done. He would also like to see the corner numbers adjusted so that they don't appear upside down if the card isn't turned just the right way. Some other games by I See Cards include Pyramath where students add, mulitply, subtract & divide their way to perfect math and Prime Bomb, the most fun kids will have learning prime numbers. Take a moment to go over to the TOS Crew Blog to see what my other crew mates are saying about the Fractazmic card game. Note, I See Cards sent me a Fractazmic game for free as a part of the TOS Homeschool Review Crew, in exchange for my honest review.